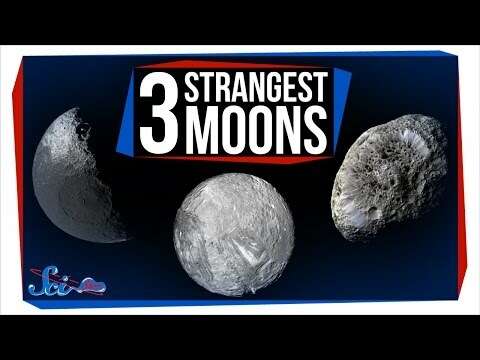 Our Solar System has some pockmarked, weird and contorted moons. Let's have a lok at a few of them. 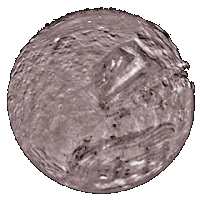 First up: Miranda, Uranus’s largest moon. Miranda has some very distinct features that have left astronomers wondering why it’s so ugly. As well as the usual craters and pockmarks that cover any rocky object with basically no atmosphere, Miranda has deep, almost parallel gashes running along its southern hemisphere. It looks a bit like a ball of yarn. These deep grooves are confined to three regions in the Southern hemisphere. Astronomers have a couple of ideas about where these features come from. More recently, researchers have suggested that the ridges and grooves are actually Uranus’s fault. As Uranus and Miranda orbit, they pull on each other, deforming each other a little bit. And that deformation would generate some heat inside Miranda — maybe enough cause to geological activity, like icy volcanoes or stretching, which could have formed those ridges. There are still some unresolved questions, though. Like, why these ridges are only found these spots. We might have to wait until the next mission to Uranus to find out. 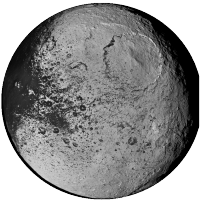 Next, let’s look at Iapetus, one of Saturn’s dozens of moons. Iapetus looks like the death star from Star Wars, after it’s been splatted by the mother of all seagulls. Half of it is covered with some unknown, dark substance. It also has a big ridge running along the equator, which was discovered by the Cassini orbiter in 2005. Scientists have come to a kind of consensus about the dark material: they believe it’s caused by two factors. First, Iapetus sits right inside the Saturn’s “Phoebe” ring: an enormous, diffuse ring discovered surrounding Saturn in 2009. Dark material from the Phoebe ring falls into Iapetus, mostly on the leading side. Second, ice sublimating, or vaporizing, off of Iapetus’s surface leaves behind a residue of darker particles that were suspended in it. The part of the moon that’s already a little darker because of the material from the Phoebe ring is also a little warmer, so more ice sublimates on that side. The equatorial ridge is still a mystery, though! One option is that Iapetus used to have rings — or “moon moons”, if you will — but the ring material fell into Iapetus, creating a ridge along what was once the ring’s orbital path. It’s also possible that Iapetus just used to be very squat, and the bulge is all that remains from that period of its life. Lastly, let’s look at Hyperion - another of Saturn’s odd moons. It looks a lot like a sponge. It’s about as big as something can be before its gravity forces it into a more spherical shape. It’s strange texture is probably because Hyperion is mostly ice, and not very dense. So when it’s hit by meteorites, they just punch down through the ice like a very aggressive knife through butter, giving it that spongy look. But even though it’s mostly ice, Hyperion is a lot less reflective than we’d expect it to be. So there’s a layer of some substance on there, but astronomers don’t know exactly what it is. It resembles the material on Iapetus’s dark side, and as Hyperion is very icy, sublimation might also play a role on Hyperion. But Hyperion doesn’t just look bizarre, it also behaves strangely. Its rotation is ‘super chaotic’, meaning that it’s very hard to predict which way Hyperion will be facing at any given time. That probably comes from the way Hyperion’s lopsided orbit lines up with the orbit of Saturn’s largest moon, Titan, which leads to a gravitational pull from Titan that keeps Hyperion’s orbit lopsided, and its rotation from stabilizing. So, ugly or not? Beauty is in the eye of the beholder, they say. But studying them has also helps us learn the history of our solar system.